MANILA, Philippines – After three months of intense Commissioner’s Cup basketball action, the stage is now set for the conference finale. It has been two years since Talk ‘N Text and Rain Or Shine faced each other in the Philippine Cup Finals, where the Tropang Texters swept the Elasto Painters, 4-0. 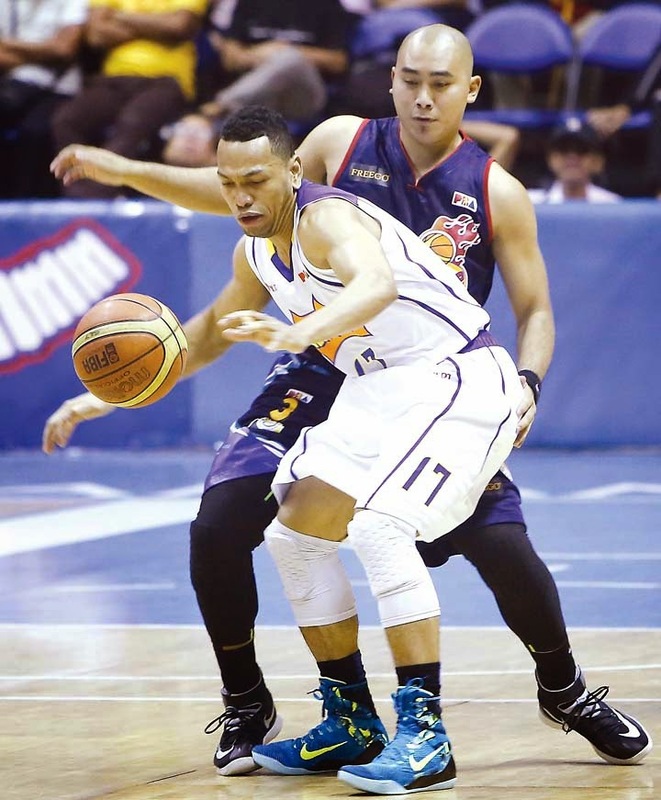 The Tropang Texters extended their series winning streak against the Elasto Painters by beating the latter 99-92 on Wednesday, April 15, 2015 at the Mall Of Asia Arena in Pasay City. All eyes now on the best point guards in the archipelago: Jason “The Blur” Castro and Paul “Lethal Weapon” Lee. These two court generals played their very best during the semifinals in order to bring their teams in the championships. Both players earned Best Player of the Game awards on their respective semis matches to make this finale more exciting to watch. Rain Or Shine Head Coach Yeng Guiao continued his unorthodox player-rotation in the finals. He opted to start his “Super Subs” Jireh Ibanes and Jonathan Uyloan along with Beau Belga, Paul Lee and import Wayne Chism. Known for his defensive prowess and ability to defend strong and tall imports, Ibanes put the Painters on board with a semi hook. Ivan Johnson on the other hand gave the Texters their first 4 points. The battle of the point guards started with “Ang Angas ng Tondo”, Paul Lee fired a quick three pointer while “Asia’s Best Point Guard”, Jayson Castro fired back with his own trey. Three point shooting became Talk ‘N Text’s primary arsenal against Purefoods Star Hotshots during their semis face-off and they are very eager to bring it in the finals. Johnson, Castro and Fonacier all pulled triggers from the rainbow territory as early as the 7th minute mark of the opening buzzer which prompted fiery ROS Coach Guiao to call a cease fire. After the time out, the Elasto Painters imitated the Texters from the three point line and immediately dropped two shots from Wayne Chism and Paul Lee. Texters forwards Ranidel De Ocampo and Kelly Williams owned the front court to give their team a five point 28-23 first quarter lead. Another Rain Or Shine three point specialist, Jeff Chan, was reportedly seen limping and hobbling before the game. Many fans feared that Coach Yeng Guiao might not utilize his left-handed shooter in game one due to an undisclosed injury. Painters’ supporters got a sigh of relief when Chan was finally sent in. Good ball movement and distribution gave the Texters a double-digit advantage, 38-27 midway of quarter number two while the Elasto Painters solely relied on their prolific import Wayne Chism and Paul Lee with 13 and 11 points respectively. Jeff Chan announced his long overdue re-entry with a bang from downtown seconds after the two-minute warning of the first half. “Extra Rice” other half, JR Quinahan ended the first 24 minutes of game one with two foul shots but the Texters were still up by a single-digit 49-41 lead. Coach Yeng was able to limit Jayson Castro in the first half, but Ranidel De Ocampo adjusted from the scenario and took the scoring chores from the semifinals hero and listed 18 points with more than 8 minutes still remaining in the third period. Rain Or Shine had its chance to close the scoring gap due to Ivan Johnson’s four personal fouls in the penultimate quarter but Painters big men forgot to use this advantage, instead, chose to shoot from the perimeter and outside. Coach Uichico gambled on Johnson and decided to leave him on the floor to protect their margin. The stone-built Texter reinforcement continued to play hard despite of getting into foul trouble with an and-one and three point basket. At the 3:36 mark of the third, the Rain Or Shine Elasto Painters whole bench stood-up after Ivan Johnson bumped and hit Coach Yeng Guiao off transition. Johnson was slapped with a technical foul after the official’s review, proving him guilty of that illegal contact. Momentum abruptly shifted to Rain Or Shine’s side after the sideline incident. Wayne Chism exerted humongous efforts under the rim to trim the deficit into just 6 points entering to the final 12 minutes of the ball game. Just when the Elasto Painters were slowly catching up, the Texter’s good ball distribution and balanced scoring spoiled their comeback and regained their double-digit lead with six more minutes remaining in the final period. “Extra Rice Corp. CEO” Beau Belga got fouled out of the game after sending Ivan Johnson sprawling on the floor. Belga’s exit became money for Ranidel De Ocampo who had 24 big points and earned the Best Player of the Game award. Both squads have until Friday to revise their game plans as they meet again for the game two of their best-of-seven series at the Smart Araneta Coliseum, in Cubao, Quezon City at exactly 7:00pm.